If you're constantly bothered by how chunky your wristwatch is (who isn't?) 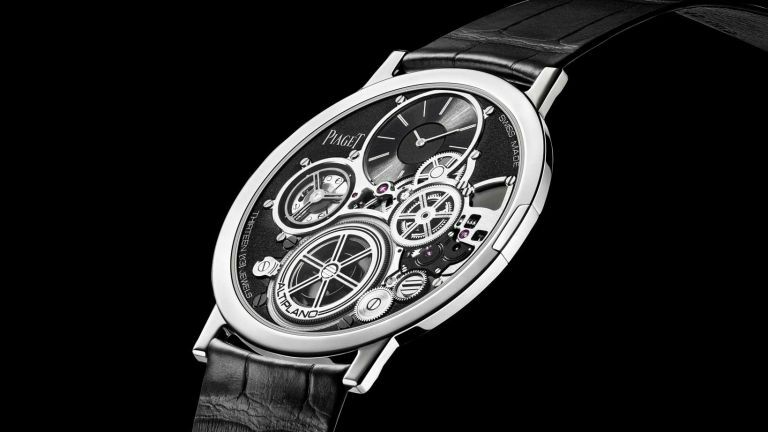 then keep reading, because the Piaget Altiplano Ultimate Concept just announced at SIHH 2018, is the thinnest mechanical watch ever created. The concept's history starts back in 1957, when Piaget created the Calibre 9P. At the time it was one of the thinnest movements ever made, measuring 2mm thick. Fast forward 61 years and, with the Altiplano Ultimate Concept, Piaget has broken a new world record in its quest for ultimate thinness. The AUC, as we're calling it, measures just 2mm thick. That's not 2mm for the movement, that's 2mm in total – the case, movement and crystal. It took four years of research and development to make this exceptional ultra-thin mechanical watch a reality, with Piaget's watchmakers, designers and case manufacturers working together to reduce thickness without sacrificing precision or aesthetics. The piece is crafted from a new high-tech cobalt-based alloy that makes it possible to combine thinness and solidity. Machined in its case, the main plate and the caseback are treated with black PVD, while the wheels are either engraved with a sunburst motif or circular-grain. Covering the ultra-thin movement is 0.2mm of sapphire crystal. For comparison, the crystal in a regular watch generally measures 1mm. Finally, the new Altiplano is finished off with a tiny 1.1mm band with a strip of kevlar running down the centre for strength. Now, as the name suggests, the Altiplano is just a concept for now, but we can expect to see a commercial version at some point in the future.